I love experimenting with new flours and was very excited to receive a collection of specialty flours as a recent birthday present (thank you Yasmin!). One of the flours in the bundle was chickpea flour and, as a big fan of chickpea dishes, this was the first flour to enter my bread lab. 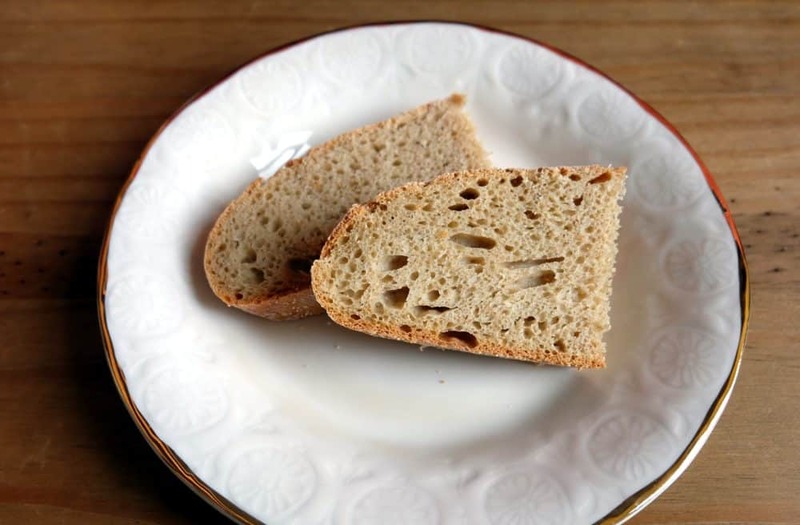 In this post, I’ve typed up my chickpea flour bread baking notes as well as my recipe for a chickpea flour sourdough bread. The flour I’m baking with is gram flour (also sometimes called besan flour) which is milled from gram or chana dhal, a kind of small chickpea. The dried chickpeas are ground into a fine pale yellow powder. The flour has an earthy, beany flavour best suited to savoury bakes. It’s recommended to limit the amount of chickpea flour you use in a loaf of bread. Work with 10% to 35% due to its strong flavour and ‘pasty mouthfeel’ as Andrew Whitley describes it. Chickpea flour is nutritious and a good source of protein (12.8g per 100g) and fibre (9.7g per 100g). The nutritional values are for Doves Farm gram flour. Here are the results of my chickpea flour test kitchen. My first venture involved making chickpea flour part of my weekly sourdough baking routine. The first few chickpea flour sourdough bread loaves turned out well. However, I still preferred the taste and texture of my standard Kamut & flaxseed sourdough loaf. Recently, I started to incorporate fennel seeds into my chickpea flour sourdough and am much happier with the flavour. I feel pleased enough to finally share the recipe with you. Hope you like it too! On day 1, refresh your sourdough starter. 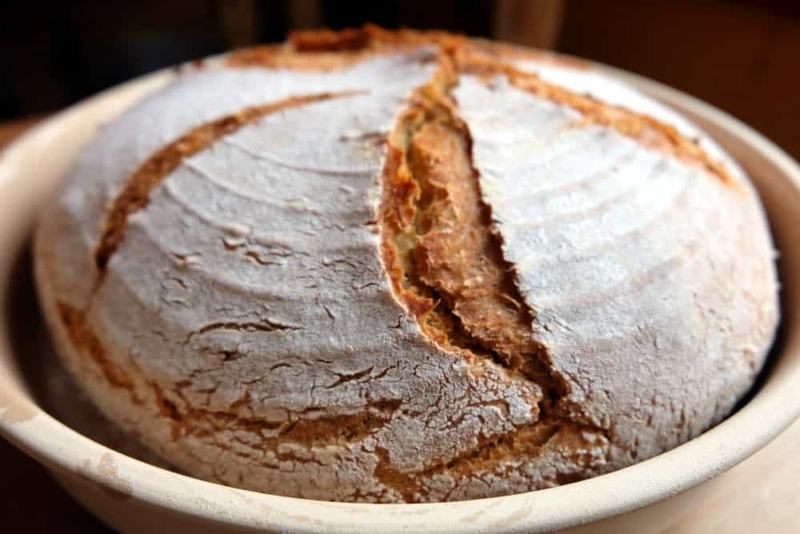 In a medium bowl, combine the sourdough starter, the flours and water and mix well. Cover and leave to stand at room temperature for 16 – 24 hours. On day 2, combine 200g sourdough (the remaining 30g go back into the fridge for future bakes), the flours, salt, fennel seeds and water. Form a dough and knead for 10 minutes. Use your dough scrapers to help with this process. Shape into a boule, place the dough back into your bowl, cover and leave to stand at room temperature for about an hour or so. 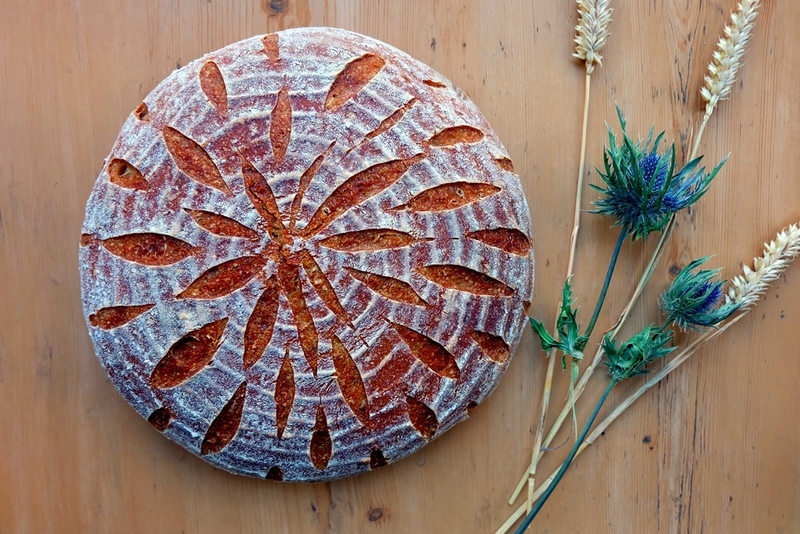 Turn out the dough, give it another quick knead and shape into a round loaf. Prepare a flour bath (I use rice flour on a large plate) and lightly flour a proving basket. Cover the loaf in flour by carefully moving it around the flour bath. Hold it together at the top to make sure the bottom side is kept nice and smooth. Place it seam-side up into the proving basket, cover with a polythene bag and leave at room temperature to prove for several hours. The time it takes to prove will depend on the temperature in your room and the vigour of your sourdough. In my kitchen, this takes about three hours. Preheat the oven to 220°C and if you are using a La Cloche baking dome, preheat this in the oven from cold as well. Otherwise, line a baking tray with baking paper. 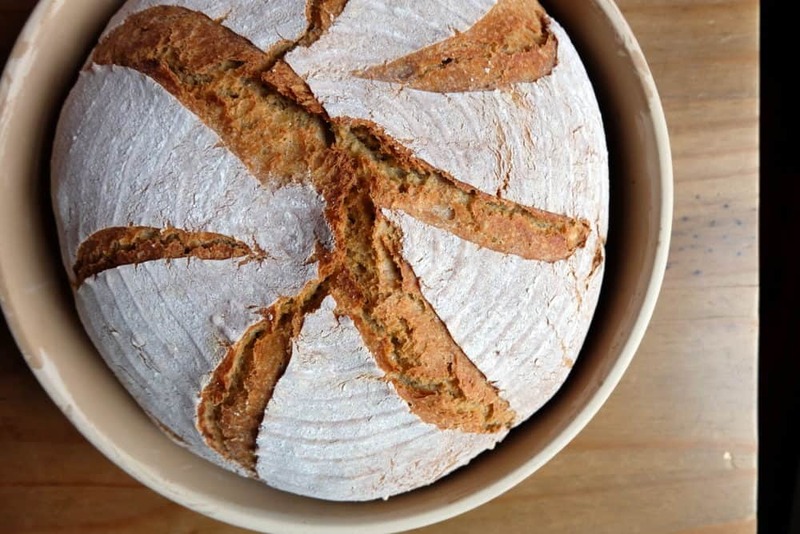 Turn out the loaf onto the hot La Cloche plate or baking tray and bake for 10 minutes at 220°C and for a further 50 minutes at 200°C. 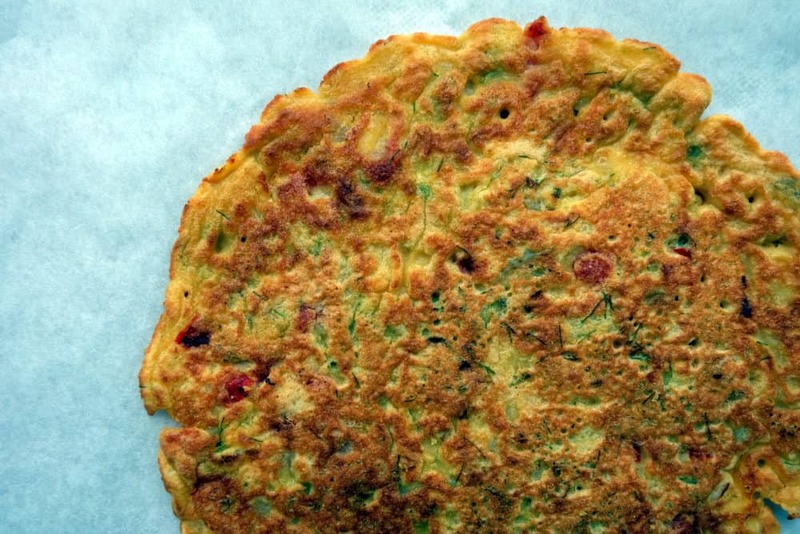 Next up – chickpea pancakes. I used this lovely recipe for Coconut-Chickpea Crepes with Smoky Herbed Mushrooms. The pancakes were delicious and the filling complemented the subtle yet distinguished flavour of the chickpea pancakes perfectly. Even better are these incredibly flavoursome Rajasthani Besan ka Chilla pancakes – perfect for a late weekend breakfast. 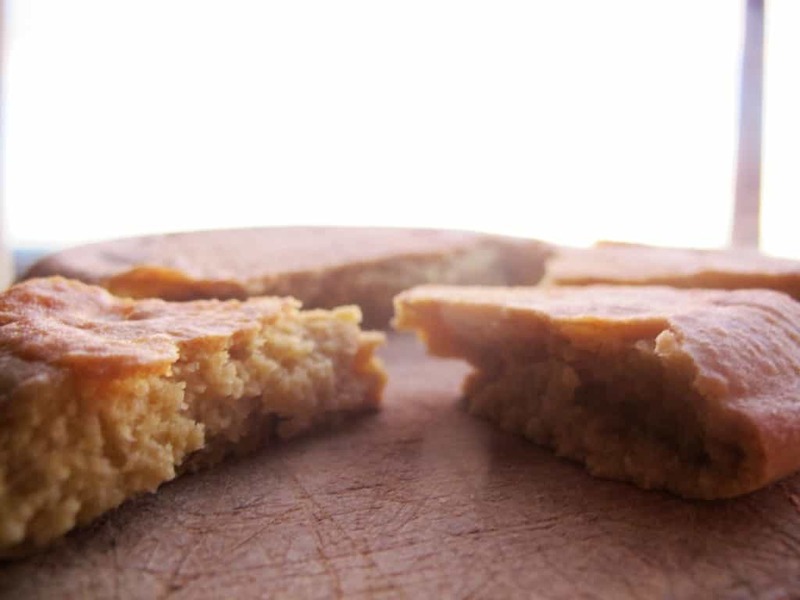 Finally, I also had a go at the famous Farinata (also called Socca), an unleavened flatbread made with chickpea flour. It was perhaps the easiest bread I’ve ever made, but will I make it again? The taste of Farinata is quite overwhelmingly ‘beany’ and getting the seasoning right is therefore key. Having tried a few variations, I can recommend this version of the recipe from Cinnamon Girl. If you are using chickpea flour successfully for bread making and you’re happy with your results, please share your recipes and experiences. If you haven’t used it before, you can simply order Doves Farm Chickpea Flour online.